Tiarra Abell ’12, a double major in Spanish and anthropology, is spending her December break in Ecuador doing research. As the end of the semester approaches, Bates students are looking forward to a break from late nights in the library and a chance to spend the holidays with friends and family. But for senior Tiarra Abell of Louisville, Ky., winter break is a time to get some real work done. At 4 a.m. Dec. 10, just hours after her last class of the semester, Abell began her journey back to Ecuador, where she spent her junior semester. Along with 11 other seniors, Abell received a Barlow Thesis Research Grant. Established by David Barlow ’79, the grant’s goal is to enhance the study-abroad experience. 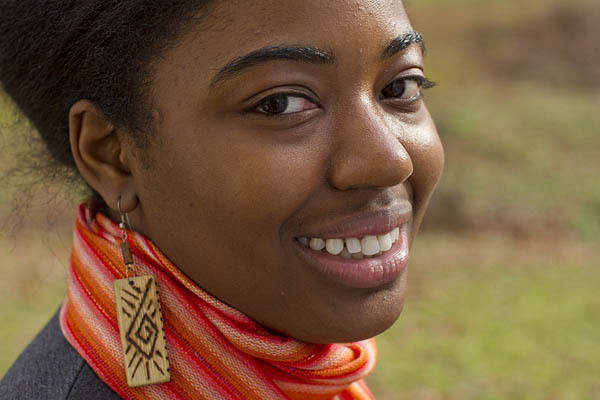 A double major in Spanish and anthropology, Abell is writing two senior theses, both investigating the lives of the Afro-Choteño community in Chota, a rural village with a population of 800. While living with a host family in Chota last spring, Abell was struck by the warmth and generosity of the Afro-Choteños despite the poverty in which they live. The timing for the return visit could not be better. After witnessing Easter in Chota, Abell was inspired to write her Spanish thesis on the role of faith in the lives of the devoutly Catholic Afro-Choteños. Abell hopes that spending Christmas in Chota will allow her to gather valuable interviews and photographs for her thesis. After Bates, Abell plans to pursue a career in medicine. While in Chota, she volunteered at the local health clinic. She will return to the clinic to gather more field notes for her anthropology thesis on the economic and racial inequalities affecting medical treatment in Chota. Most of her time will be spent in Chota, but Abell will visit Quito and Otavalo to gather books and articles that are not available in the United States on the Afro-Choteños. During this time she plans to meet Carla Guerron, the author of one of her primary sources, El Color de la Panela (“The Color of Brown Sugar”).